If you’ve poked around my website, you’ve probably figured out that I’ve been involved in pro audio for a long time… if you count when I started on my media degree in college, about thirty years. The way we listen to music has completely changed since then. Vinyl records have greatly declined, of course, and listening to music with MP3s is certainly more convenient. But vinyl still sounds good… in some cases better*… than many of the downloaded stuff that’s common now. 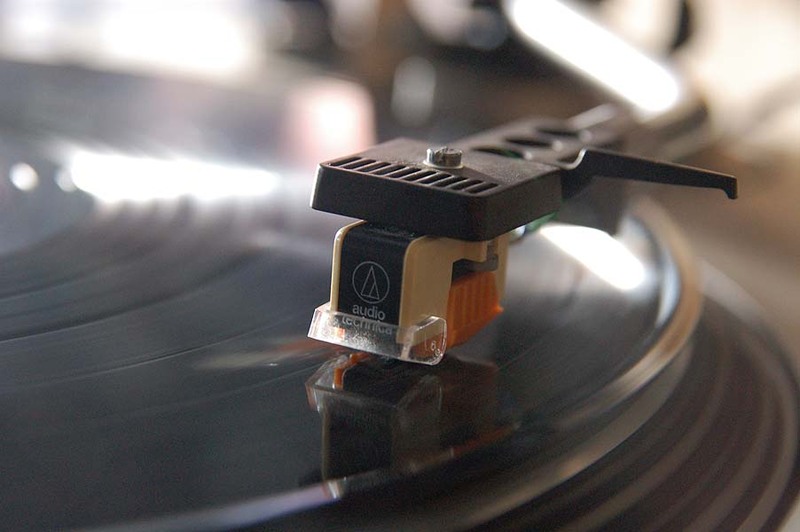 Transferring vinyl to MP3 makes a lot of sense, especially if the music you love is not available on iTunes. Playing a record causes a tiny bit of wear to the disk. If you transfer to a high-resolution MP3 for everyday playing, your records can stay pristine virtually forever. I save all transfers at 320mbps, the highest-quality (least amount of compression) MP3 setting available. The question often arises, “is this legal?” As long as you didn’t steal the vinyl copy you’re providing to me, and you use the resulting file for your personal use only, the answer is yes. It is perfectly legal for you to make a backup or archival copy of any record that you own, as long as you do not attempt to re-sell multiple copies. Please note that I only make transfers of records that you personally own. I require a signed Terms Of Service agreement that basically says you promise not to violate any copyright laws with the files I provide (i.e., posting them on a file-sharing site). I can also offer archival transfer services. If you have any recordings on cassette tape, you should attempt to copy them to a non-tape format as soon as possible. I charge $10 per cassette for transfers. I don’t offer reel-to-reel transfers at this time, though that may change depending on demand… please contact me for a quote. Depending on your storage conditions, it may already be too late. Recording tape doesn’t last forever. As it ages, the surface can get “sticky,” and it will refuse to play across the heads. Sometimes it is possible to get a single transfer from a deteriorated tape by “baking” it, but not in an oven. the tape is gently heated in a box warmed by a hair dryer for several hours. After this treatment, you get one chance to play the tape back, as the oxide falls off the backing as it is played… quite a mess, really. Unfortunately, I see records that are not worth transferring. Here’s how to determine the condition of your collection. The biggest problem is probably scratches and wear. Scratches can vary from light scuffs to deep scars and everything in between. Goldmine Magazine has a useful system for grading records that assigns one grade for the covers, and one for the vinyl. Naturally, I’m more interested in the condition of the vinyl, but you might as well preserve and protect the covers while you’re at it. Go get your records RIGHT NOW out of the attic. The heat will surely warp them. Store them on edge, NEVER FLAT, and keep them cool and dry. A good article on record care is here. 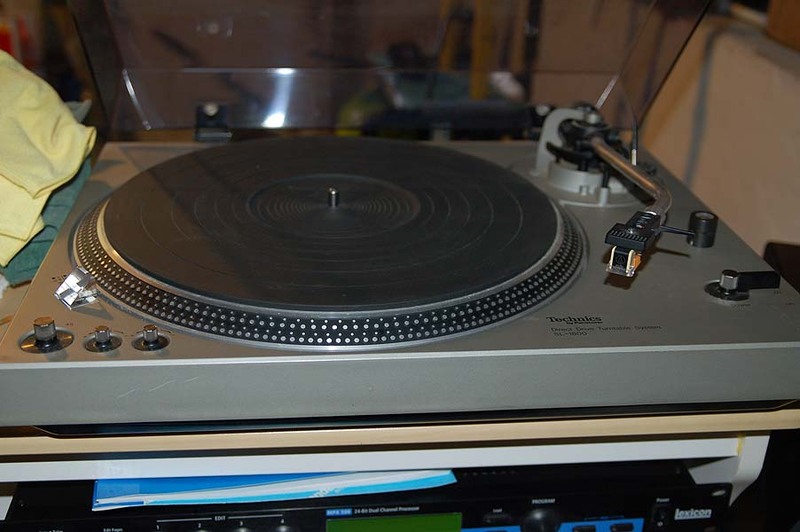 Records that are scratched, naturally, will not transfer well, even when the scratch can be made to play through adjustment. And while I do have noise reduction capability, I don’t generally like to use it as it alters the overall music playback somewhat. Slight EQ adjustments can be applied, but only when warranted. I clean all records before they are played. If the surface of your records appears heavily scratched, you may want to replace it with a better copy before you have it transferred. Some people are realizing the benefits of vinyl… this article recently appeared in Time Magazine. My previous vinyl-to-MP3 transfer setup. It was built into a surplus microwave cart. Speakers. Again, not absolutely necessary unless you are doing critical monitoring. But it is a lot more fun to hear what’s being transferred. 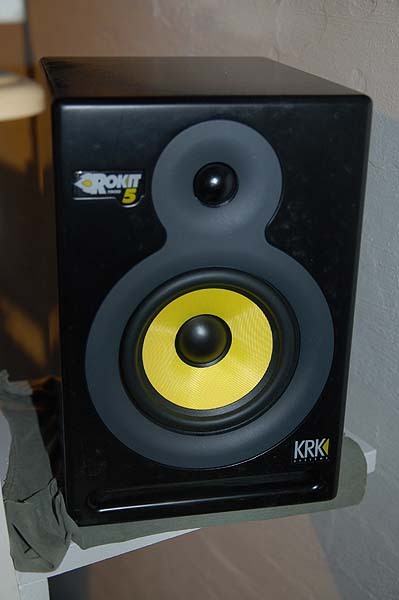 I use a pair of KRK Rokit 5 studio monitors. $300. Once you’ve transferred your classic album into MP3, corrected the scratches, filtered out the rumble, added track codes, and done all this work, you’ll be tempted to share it with the rest of the world. DON’T! This is the main reason why the recording industry is a smoldering bus wreck right now, and so many of us are wondering where our next meal will be coming from. But there’s an exception to this rule… if someone owns a vinyl record, it’s perfectly legal for them to have an MP3 copy for their personal use. So if you have a friend who has a record that is also in your collection, it’s probably OK to share that file. I say “probably,” because there’s probably a lawyer somewhere who can claim the personal copies have to come from the record owned and not from another source. I’m no legal expert, so the standard disclaimer applies here… share at your own risk! * There are lots of theories about various forms of recorded music. Most of these are centered around analog vs. digital arguments and which is better. Speaking for myself, I cannot tell much difference between the two, provided a high-quality sample rate or a good-quality recording. Rather, I find that I prefer listening to some music- especially that recorded before CDs became the preferred delivery format- on vinyl. 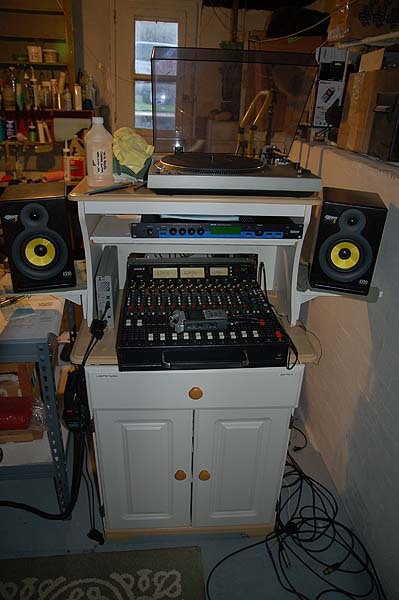 Great pains were taken to optimize a master tape for the limitations of stereo vinyl. It was how the music was intended to be experienced. Songs were carefully ordered, and those nearer the edge of the disc had greater dynamic range than the inner songs, since the needle has a greater surface speed. Low frequency excursion was carefully considered, as out-of-phase bass information could cause the needle to skip. Other theories consider the effects of odd-numbered harmonic distortion (i.e., distorting the first, third, fifth, seventh harmonics et cetera) and how we tend to find this sort of distortion more pleasant than even-numbered harmonics. But my personal favorite theory is that of familiarity. I’ve listened to a lot of hours of music delivered via turntable, so I’ve come to associate the rumble, clicks and pops as a part of the experience. (within reason, of course) The noise that occurs between songs sort of belongs there. When it’s made pristine (via digital remastering) it just doesn’t sound the same. There are exceptions, of course… excessive sibilance, which is s splattering sound whenever the “s” consonant is heard is always unwelcome and a particular problem with vinyl. All my Jackson Browne records suffer from this problem, and it becomes worse as the record wears out. It’s sometimes caused by faulty mastering as well. I got to your website via a search that I did for info on my old EV CO-90 mics that I bought years ago so I’m now reading your vinyl page here and wondered what kind of noise reduction and click and crackle removal you’re doing. Since 2001 I’ve been doing some great transfers from a Michell Tecnodec with their TecnoArm using a Sumiko Blackbird cartridge. I bought a Lynx Studio L22 PCI card and record everything at 192Khz / 24 bit and I’m very pleased with the sound. The biggest fly in the ointment has been cleaning the sound without ruining the great stereo soundstage that a lot of vinyl has. I started out using Sony Sound Forge 6 and now I’m up to V 10 but none of the plugins that cater to vinyl processing have never improved. Even though I vacuum clean the records and only selectively record the best stuff the SW seems to always limit my end results. Recently I had a chance to do a full Demo for 2 weeks of two plugins from a German company called Algorithmix, “ScratchFree” and “NoiseFree”. The results I got on a beautiful copy of a 1959 Columbia release of Doris Day’s “Showtime” album was really astounding. Of course each plugin (VST type) priced out at just around $1500.00 and normally I wouldn’t opt out for something in that price range but after all the years of frustration I’m really considering both. So after reading your comments on your process I’m curious just how those vinyl records sound as MP3’s. Myself, I’ve never considered going there and now have just purchased the Zoom H4n recorder which I’ll down sample my files to 96Khz/24bit and put on the SDHC memory chips to take on the road. The real purpose for the Zoom of course is to try some 4 Ch recording in the field using the onboards along with my old EV CO-90s pipped into the XLR inputs. I’ve been a lifelong musician up till about 20 years ago always playing with a turntable, musical instruments, reel to reel tape recorders and now computers. Well without going on endlessly here I would appreciate your comments and any helpful tips you would add regarding the H4n project. I’m going to Germany next spring and want to try recording some pipe organs and things like church bells to add to my travel videos. Thanks for your note. I see several questions that I’ll try to answer in order. 1) Click and crackle removal- The software have is Adobe’s Soundbooth CS4. It was available separately for awhile at a good price, but I believe they’ve increased the price on the newest version. Generally, I use NO click/crackle reduction over the entire track, but I do use it a) during fade-ins, b) during fade-outs, c) at the guardbands between songs, and d) to correct particularly noticeable pops. Usually there’s enough program to mask most groove artifacts, and if there’s a SMALL amount of crackle, then I leave it alone. It’s a part of my listening experience growing up with vinyl, and it has become a part of the music for me. Now, sometimes a record is just plain worn out, so I’ll try to find a better copy to transfer. If a song has a big pop in it, I’ll zoom in to the offending section with soundbooth, and apply noise correction to just the segment with the pop… usually a few milliseconds… but the goal is to leave the record alone as much as possible. Most records improve with a good cleaning, and I understand the expensive automatic cleaners give wonderful results. But I’m undercapitalized for that sort of thing. Besides, it’d be more fun to design & build my own piezo-powered ultrasonic immersion cleaner. About the sound of MP3. It all depends on how you listen to music. If you have a listening room that’s quiet, with good speakers, then MP3s probably won’t cut it. For casual listening, though, i.e., driving around in the car or while you’re working, it’s certainly fine. Even the difference between 320kbps and 256kbps MP3s is really slight for casual listening. I find that most of the records that I transfer to MP3 sound better than the digital copies of the same songs (not all of them), but I attribute this as much to mastering differences than the medium itself. Congrats on the Zoom. You’ll like the unit… in terms of features vs the price point, it’s hard to beat. It has some irritating things about it… most notably to do with line input levels.But it’s a big improvement over the old H4. I’m currently experimenting with different cables to get the damn thing to take 4 line level inputs via the external mic jack so it can record four tracks in the field at once, i.e., four line outputs from my Sound Devices 442. It may be easier just to roll two 2-tracks. 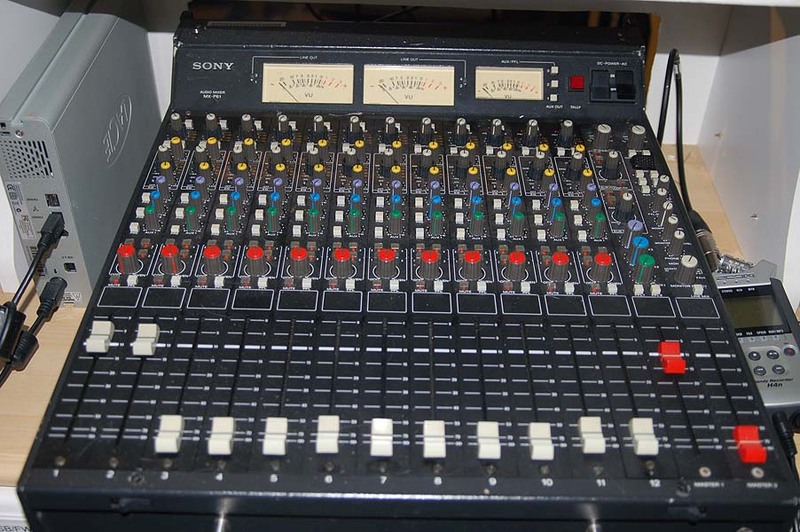 Frustrating to think that Zoom could’ve added two more XLRs for twenty bucks, and had a unit that is unique in the marketplace (a handheld-size true 4-track recorder that can easily fit in a portabrace for run-and-gun iso tracks). One of my ongoing projects is a good Portabrace-style case for the H4n, but it’s hard to do well. We just returned from Germany last week… it’s a wonderful place, you’ll love it. Did you create this site yourself? Please reply back as I’m hoping to create my own blog and would love to learn where you got this from or what the theme is called. Cheers! Great site, thanks for all the info. BTW, Zoom recently came out with a 4/6-CH hand-held recorder, not bad at $400 and I think, although not sure, that they included a mic/line option on XLR inputs. Cheers!